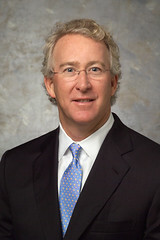 Aubrey McClendon is out at Chesapeake Energy as chief executive officer, accelerating the rapid changes in the dynamic of Oklahoma City’s corporate power structure. Will Oklahoma City’s SandRidge Energy CEO Tom Ward be the next to go? The roster of the big business players of Oklahoma City started changing in the fall of 2011 when Philip Anschutz, a Colorado billionaire, purchased the Oklahoma Publishing Company from the Gaylord family, who had owned and operated it and its flagship publication, The Oklahoman, since their inception decades ago. Then, in December, Larry, Nichols, CEO of Devon Energy Corp, retired from the company, a company he and his father, John Nichols, started in 1971. Now McClendon, pictured right, who has been under fire from stockholders for his leadership, alleged conflicts of interest and the company’s recent poor performance, recently outlined in a Reuters investigation, announced his resignation/retirement from the company yesterday. In an announcement about leaving the company, McClendon cited “philosophical differences” with the company’s board of directors. Chesapeake’s stock rose on the announcement. Chesapeake was founded in 1989 by McClendon and Ward, who later left the company to form SandRidge. But now Ward faces his own problems. A stockholder group, TPG-Axon, has asked for a change in leadership at the company, alleging Ward may have a conflict of interest with family members. “. . . there can be no doubt that SandRidge’s Board of Directors has failed stockholders by allowing its CEO’s immediate family, using entities he created or funded, to compete with the Company in one of the most crucial aspects of its primary business . . .,” according to a statement issued by TPG-Axon. Ward’s and McClendon’s situations seem somewhat related in terms of their philosophies of business approaches, though the specific circumstances are different. It appears Nichols, who is 70, is simply retiring. The Gaylord family took the money and ran in a time of media downsizing, leaving behind a legacy business with a great deal of local power. What all this means for local corporate-sponsorship projects, philanthropical work by these companies and their charitable giving is anyone’s guess at this point. It’s also unclear how it might affect the local political scene, sometimes dominated by the Greater Oklahoma City Chamber of Commerce, which is clearly in the same ideological camps of the larger corporations. The most pressing question is whether McClendon announced his retirement/resignation because major layoffs at Chesapeake are on the horizon, and he wanted to distance himself from that action. Chesapeake employs some 12,000 people, with its main offices in Oklahoma City. Major layoffs have the potential to devastate the local economy. No one should want that to happen regardless of their opinion of McClendon’s business style. In a larger sense, the changing corporate roster should remind all of us how fleeting and temporary businesses and their leaders can be in any given city or state. It’s about money for corporations, not city or state loyalty, and it will always be about money. Corporate worshipping and myopic charitable dependency can lead to a lack of diversity and obliviousness to important, long-range planning. That may well have happened in Oklahoma City once again. It looks like we’re going to find out. « Drug Tests For The Unemployed?